Beef Mince Jollof Rice is a tasty version of Nigerian Jollof Rice prepared with minced beef or ground beef. If you have kids who do not eat their lumps of meat after eating a meal, this is a great way to make the meat disappear into the rice without them knowing that they are eating meat. 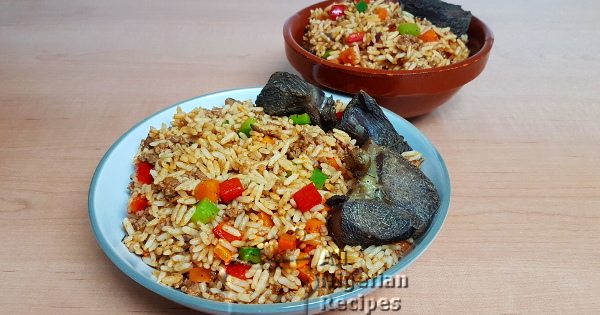 I used lumps of meat too because in Nigeria it is disrespectful to serve a meal such as Jollof Rice without at least one lump of meat. You can use habanero peppers (atarodo, ose oyibo, atarugu) if you do not have black peppers. I prefer black pepper for Beef Mince Jollof Rice. Use any beef flavour seasoning/boullion cubes. I highly recommend red onions; it adds colour and a nice flavour to the meal. I normally use a ration of 1:1 for the rice and beef mince but feel free to add more beef mince if you wish but never less (in cups) than the rice. If you do not have tomato stew, prepare some. Click here for details on how to do that. Cook the chunks of beef with two small stock cubes, 1 tablesppon of thyme and one thrid of the chopped onions. When done, set the stock aside and grill or broil or deep-fry the meat. For a perfect Beef Mince Jollof Rice, watch the video below, click here. Add one third of the diced onions and fry for 2 minutes. Add the beef mince and stir quickly and continuously till pale and crumbly. Please see the video below for how I do this. Add 1 tablesppon thyme and 1 small stock cube. Stir and pour the beef stock/broth into the pot. Add the tomato stew and the black pepper, stir, cover and leave to boil. 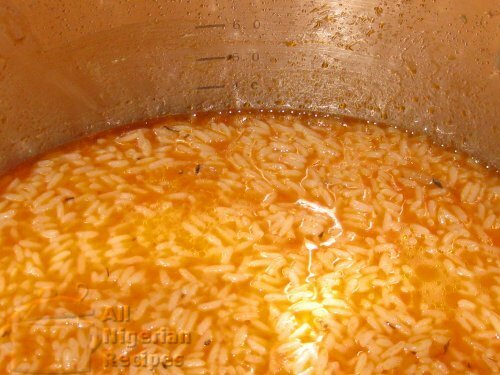 Add the drained parboiled rice, stir and make sure the water level is at the same level of the rice. If less, top it up. Add salt if necessary. When you can no longer see the water (but it is not yet dry), add the diced carrots. Stir the top of the rice, cover and continue cooking. When the water dries up, add the diced red pepper, green pepper and the remaining onions. Stir very well and cover the pot again. Once it steams again, it is done. If you parboiled the rice as shown in the video below, the rice should be done by the time the water is dry. Serve with the grilled beef, Fried Plantain, Nigerian Moi Moi, Nigerian Salad or Coleslaw.